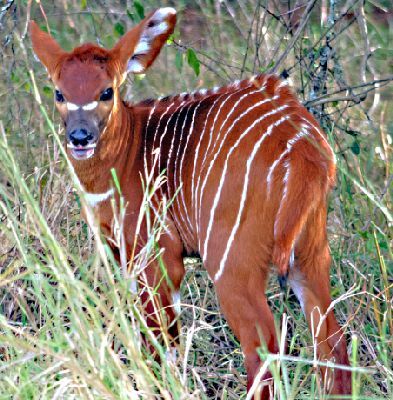 True Wild Life | Bongo | The bongo is a reddish-orange hoofed animal with white stripes running vertically along the body of the bongo. The bongo is the one largest species of Antelope and the bongo is generally found grazing in herds in the African forests. The bongo is one of the only animal species in the world of which both the male and female bongo individuals have horns. 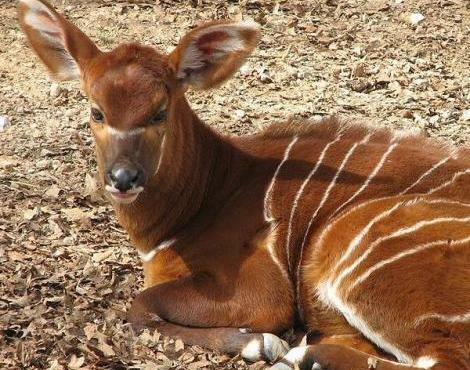 The horns of the bongo tend to be fairly long and in most cases, slightly spiraled or wavy in appearance. The bongo uses these horns both for defense purposes and in the case of the males, it is believed that the bongo individuals with the largest horns are the dominant male of the bongo herd. 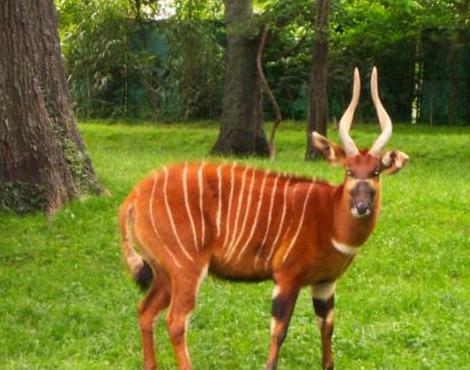 The bongo is generally found in the more mountainous regions of central Africa, where the bongo inhabits dense woodland and can be found up to an altitude of 4,000 meters above sea level. Despite the colourful appearance of the bongo, the bongos white stripes actually aid the bongo in being camouflaged very successfully in the thick forests. Originally, bongos were found in three different parts of Africa, East, Central and West. Today all three populations of the bongos ranges have shrunk in size due to habitat loss for agriculture and uncontrolled timber cutting as well as humans hunting the bongo for meat. Despite the fact that the bongo is a solitary animal, the bongo is rarely seen in herd sizes of more than 20 bongo individuals and these herds comprise predominantly of the female bongos with their young. 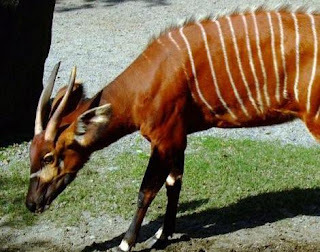 The bongo is a nocturnal animal and are generally found grazing the newly sprouting grasses and shrubs in the dead of night which also helps to aid the bongos survival in a land where there are many dominant carnivorous predators.